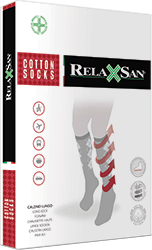 Unisex Cotton knee socks with graduated compression. Fine Cotton at skin contact, soft and comfortable elastic knee hem. Anatomical and reinforced heel and toe for maximum comfort, proper fit and long durability. Two compression degrees available, 20-25 mmHg (medium) and 20-30 mmHg (strong). Art. 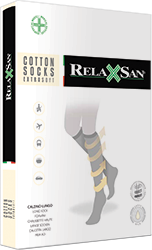 820 – 20-25 mmHg* Compression recommended for the therapy of the light chronic venous insufficiency, varicose veins and swelling. Art. 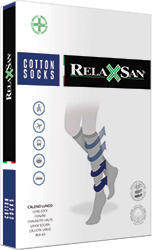 920 – 20-30 mmHg* Compression recommended for the therapy of the venous insufficiency, varicose veins, oedema. Phlebitis, after surgeries and in the prevention of the Thrombosis.